The last album in the series thus far. This one done by perhaps the most well-known or famous of all the musicians that have appeared in the Masada Books. MMW are definitely known around the jam band scene, which is why I avoided them for so long. I still don't know much of their material, save for a couple of albums...but where I didn't much care for previous work I'd heard, this album and their other album that has been released so far this year "Radiolarians 1" are both outstanding and innovative. Definitely enjoyable, cool stuff. I guess I will update the blog with the other Book of Angels releases when they end up getting released, but I hope you have enjoyed them so far (they each get about 40+ downloads it looks like). Oh yeah, over at bolachas, those dudes stole one of my links for the Fred Frith album from this year. Now that has a whole ton of downloads. Funny. The Book of Angels, Zorn's second book of Masada tunes, has been a continuing source of inspiration for the composer and his legion of interpreters. 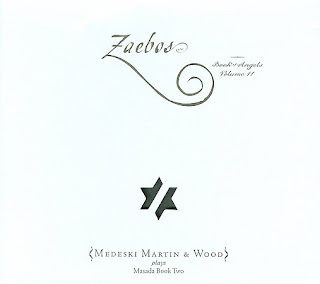 On Zaebos: The Book of Angels Vol. 11, Medeski, Martin & Wood's intimate understanding of Zorn's working method lends their interpretations of these sturdily crafted tunes an air of cleverly inspired authority. Embracing a wealth of genres, instrumental combinations and stylistic detours, the veteran trio brings their signature sound to this melodically distinctive body of work; the end result is one of their most satisfyingly diverse efforts. Dispensing with preconceived boundaries, the trio ranges far and wide across the spectrum of available sound. "Rifion" utilizes classic swinging piano trio dynamics, complete with brief detours into outside playing. "Malach ha-Sopher" unveils a moody, haunting tone poem, while "Jeduthun" adopts the stunning silences, harsh angularity and pneumatic rhythms of Zorn's own jump-cut/collage oriented approach towards popular music. Plugged-in, the trio burns white-hot as they careen through the whiplash frenzy of "Zagzagel" and the propulsive anthem "Vianuel." Medeski's vintage analog keyboards squeal and sputter, Wood ferrets out subterranean reverberations from a fuzz-toned electric bass and Martin kicks out thorny polyrhythms as the trio basks in waves of distortion and electronic sustain. Covering familiar ground, "Agmatia" and "Chafriel" ride groovy, modal melodies driven by swirling organ washes, hypnotic bass lines and snappy shuffle rhythms. Revealing their longstanding rapport, they invest the oblique angles of "Ahaij" with a string of inventive solos and edgy interplay. Maximizing the gorgeous melodic potential of Zorn's writing, "Sefrial" and "Asaliah" recall the dreamy exotica of the composer's lounge-inspired ensemble, The Gift, as kaleidoscopic keyboard washes, languorous bass pulses and spare trap set ruminations expand with cinematic atmosphere. are you going to post "masada quintet - Stolas the book of angels vol 12"?